Hay Bro Sis...The concept of bike wheel drive is not new nor is the hybrid bike. 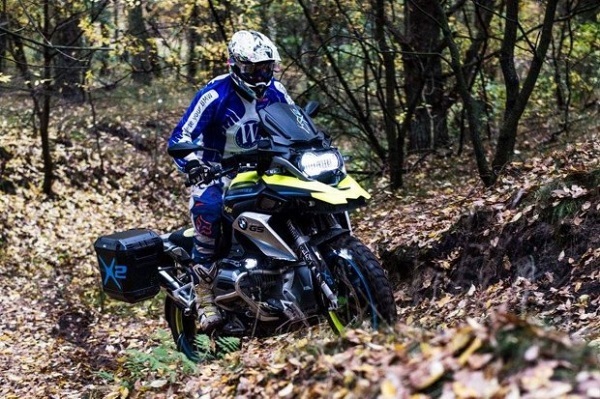 That’s right, two concepts come together in one bike and that is the iconic motorcycle BMW R 1200 GS has renewed interest. It is what has made BMW preparer, whimsical, at EICMA 2015 with the BMW R 1200 GS prototype LC. Do not be fooled with fluorescent tones coming this concept, what is important here is not what meets the eye, the drive system devised by whimsical X2 to make a difference to the conventional R 1200 GS. The electric motor is associated with a regenerative braking system that feeds the battery, which is installed in the traditional ‘peak’ front. Likewise the prototype comes with some controls in the tank for selecting reverse gear or neutral in the electric motor as well as their degree of impact. The problems arising from this type of hybrid systems for motorcycles is yes overweight is associated bearing a toll that is to pay for that extra traction and functionality when maneuvering at low speed. You can not say precisely which of the BMW 1200 GS series as good maxitrail is a featherweight, hence suspicions. Not to mention the associated cost on. BMW Motorrad dare to throw something someday series and play with that idea and is a step.